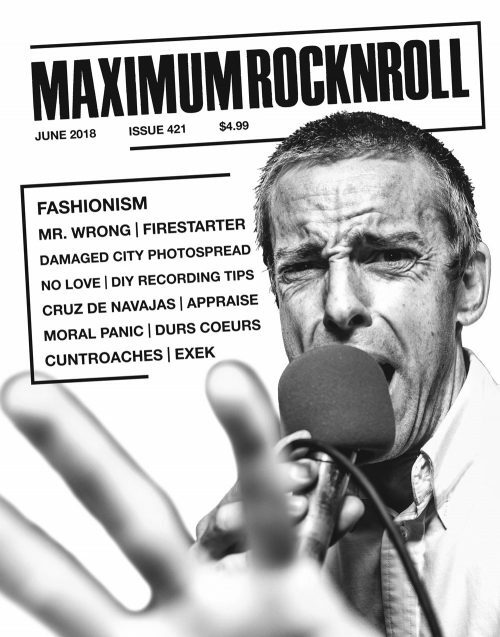 It’s time for Maximum Rocknroll #385, the June 2015 issue! Victoria and Joey from Providence’s DOWNTOWN BOYS discuss their new record Full Communism and how their politics intersect with their brand of sax-punk and their electrifying live shows, UK anarcho legends PART 1 discuss the reissue of their long out-of-print catalogue and their return to performing, and Germany’s HYSTERESE clue us into the band dynamics in advance of their US tour. 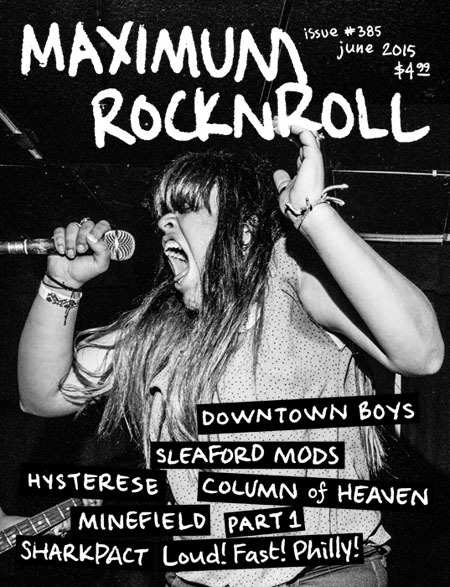 Plus, Toronto’s COLUMN OF HEAVEN‘s bassist Andrew Nolan provides a window into the changing landscape of Toronto, the team behind BAD DADDIES interviews Nottingham, UK’s SLEAFORD MODS, Russia’s MINEFIELD talk making music in the shadow of a famous arms factory, and the deep friendship that Olympia, WA’s SHARKPACT is built on is made abundantly clear. We’ve also got a reflection on the Loud! Fast! Philly! oral history project—dozens of interviews with Philly punks of all ages and stripes, and growing—accompanied by amazing portraits from Karen Kirchhoff. Farrah Skeiky takes our cover photo and documented DC’s Damaged City Fest for a photo spread, while Ochi Reyes brings us a photographic dispatch from London’s Bentfest. 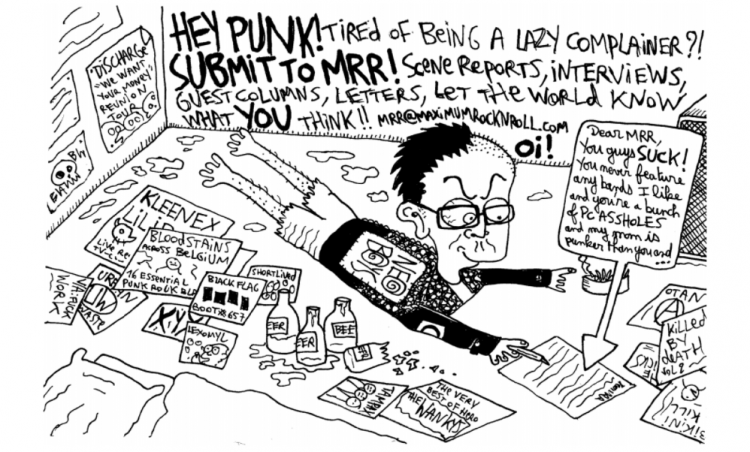 And, of course, we’ve got all the columns you’ve come to expect—including guest columns from Darryl Andrew Reid of Montreal and Sadie Switchblade of G.L.O.S.S. 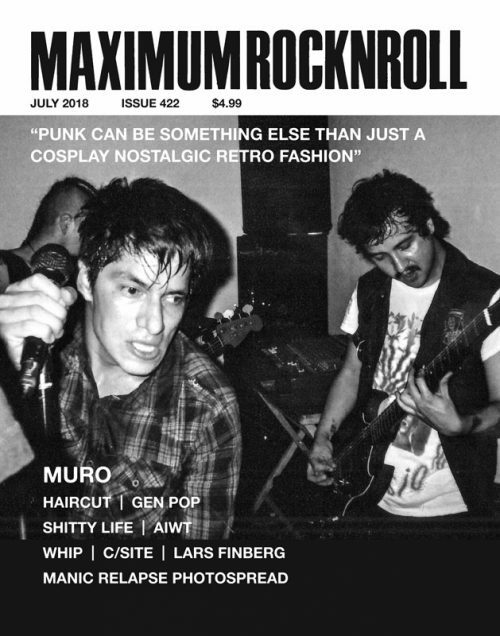 about their experiences as trans women in punk—and the largest record reviews section in punk print. Pick up your copy today!